Since "all work and no play makes Jack a dull boy", we decided to find time in our busy London schedule to visit famous Stonehenge . The idea of gigantic stone circle (which no one knows how was built and who did this) has been fascinating to us for a long time. We decided to have a closer look at this mystery and went for a trip to Salisbury Plain in Wiltshire. It's only about 87 miles (136 kilometres) from the capital and easily available to get to by bus and railway. On our way from London to Stonehenge we visited Salisbury – a town in the south of England famous for its cathedral and Stonehenge proximity. We really liked this place – the town is peaceful, picturesque and the architecture is very interesting. There's lots of small nice cafes and restaurants to have a rest and contemplate... medieval times. I'd say that the town centre has got a kind of medieval atmosphere Everyone looks very temporary but the buildings and Salisbury cathedral make you feel like you have used time travel machine and landed in a nice and friendly 14th century British town. Of course, the most important place to visit there is Salisbury cathedral . This shrine is very old (built in 13th century) and very big (covers about 8 acres of area = 32375 m2). The cathedral has also the tallest church spire in the United Kingdom (123 metres). It is unique in being built almost entirely in one architectural style - Early English Gothic. There's many tourists but the place is so spacious that you won't complain about the crowds. I'm not very much into visiting churches but the cathedral is worth seeing - the architecture is really impressive and the interior was built with an eye for detail. I especially liked the cloister – beautiful open arcade where you can have a tasty snack from the cafe and contemplate the amazing cathedral architecture. In the Salisbury shrine there is the world’s finest original Magna Carta and Europe’s oldest working clock (dated to AD 1386). There are also religious services available for everyone to join - they vary according to season and week day so it is best to check the website here . 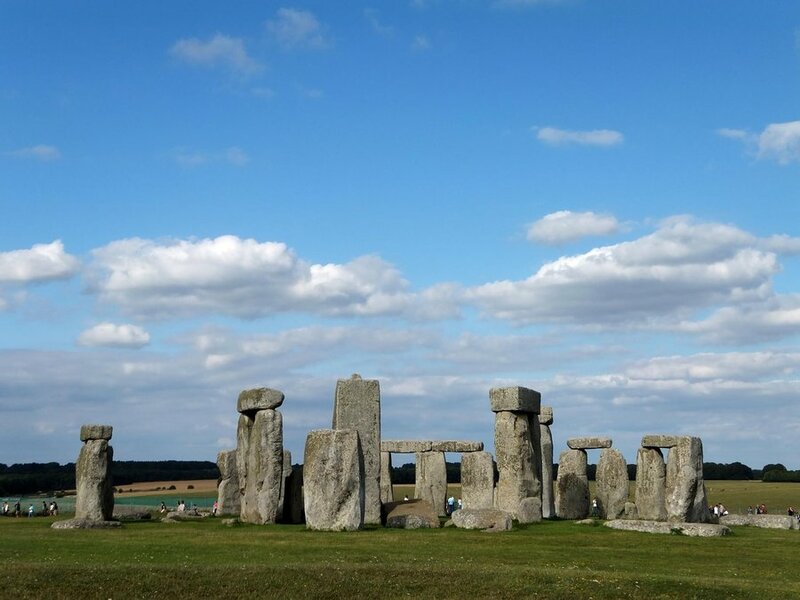 We went to Stonehenge by tour bus – the easiest way to get there. Getting to Stonehenge from Salisbury took us about half an hour. It is well-organized shuttle with convenient timetable - I recommend using it if you do not travel by car. You can plan the journey here . The Stonehenge itself was a bit of disappointment for me – it was soooo crowded . Was I in London or at Stonehenge? We had to wait in a long queue to get to the stones and then it turned out there was a fence several metres from the stones. I totally got the idea after looking closely at the rocks - they were marked by some vandals . In order to protect the place from vandalism the tourists can only see the stones from far distance. Oh well, people got what they deserve to. Some say that Stonehenge emits energy and healing powers... Unfortunately, we did not have chance to check this as the stones were too far away from the fence. I think Stonehenge is magical place ideal for relax and contemplation but there is just too many people to feel the uniqueness of it. I would strongly recommend to go there during week days or at winter time . And if you decided to see Stonehenge, definitely go to Salisbury too. You may even like it more than the stone circle. And you, have you ever visited Stonehenge? If so, what was your impression?